January 21, 2010 – If parents are reading this article, I’m going to point out what colleges love, when it comes to signing a Punter or Kicker, and what they look for early on in a kid to better the chances to getting a scholarship at a position that’s very hard to get a full scholarship. Most colleges offer ALL State, punters and Kickers tops, where they try out, and compete against usually only one Punter or Kicker on Scholarship at a DIV 1 school, or a IAA school. There are usually at least 2 other walk ons at a DIV 1 school competing for the job. LSU’s all time leading kicker Colt David walked on to LSU from Grapevine , Texas and started three years, former Louisville kicker Arthur Carmody , who made all conference at Louisville, is from Loyola Prep in Shreveport and did the same. It’s the same for punters; many punters are former walk ons from schools in Louisiana, where these kids made ALL State. The key to getting a scholarship to a college at these positions is first be able to do both great, that’s Punt and Kick, then that allows the college to spend one less scholarship , to get a kid to do a dual role in college. The punting position, they look for tall kids usually 6-0 to 6-4 that have strong legs, but most importantly, have the ability to directional punt in High School games or have great hang time. Remember in college everyone who returns punts, are usually the team’s best athlete in the open field, so it’s important a punter can either kick away, and place the ball, or have great hang time to allow the punt team to not allow a return. Kickers, they look for a kid who can kick under pressure and win games, strong leg within 45 yards, and the ability to kick the ball in the end zone on kickoffs. If you can’t place the ball in the end zone in high School, that hurts in your ability to play for a DIV 1 program. If you can master the onside kick with the ability to put the right spin on the ball, rather its turf or grass, then that’s a bonus. The best way to get a scholarship early is show off all your skills in a camp over the summer in front of the special team’s coach that can lead to a scholarship offer, a poor performance at a college camp will lead to no offers. Let’s take a look at some of Louisiana best Punters and Kickers for the 2010 class. 1. William Russ 6-4 176 Evangel Christian HS – The best Dual Punter and Kicker in the state in my opinion is William Russ, this kid has made several field goals over 40 yards in a 4 year span, most of his kickoffs end up in the end zone, he’s good under pressure, and he has the ability to master the onside kick. As a punter he has a cannon leg, with the ability to provide the proper hang time for college football. William is tall, and will weigh about 200 pounds when he’s done, his leg will then be even stronger. What I love about this kid, is that he’s trained for 4 years, has made several camps all over the country, and has received advice from many former NFL punters and Kickers over a 4 year span. William recently committed to Arkansas in the SEC and I think he’s got a shot at starting as a true freshman as a Punter. Arkansas returns a great Kicker who will be a senior in 2011. I can see this kid starting at both Kicker and Punter for Arkansas in 2 years. 2. Cody Mandell 6-2 185 Acadiana HS – Cody Mandell might have the strongest leg in the state for kickoffs that I’ve seen, when the ball is kicked off his foot, it usually goes 5 to 7 yards deep in the end zone. Cody has the build play FS, if he ever wanted too, meaning he’s a very good athlete. As a punter his punting was the best in Lafayette, and if needed Cody could start at Tulane where he’s committed at both spots right away. Cody has a leg similar to former Carencro High School Kicker Wade Richey, who played for LSU and several years in the NFL. This kid will be a weapon for a Tulane program, that hasn’t seen a Dual Punter or Kicker of his talent in state since Eddie Murray, who kicked in the NFL for several years for the Detroit Lions. 3. Chris Barnes 6-2 190 Slidell HS – The best sleeper prospect for Dual Punting and Kicking is Chris Barnes, who also played some WR for the team, and not just caught passes, but when used caught Touchdowns. Barnes has a 4.0 GPA, and is super smart. Chris will easily weigh over 200 pounds in college, and he has the height you look for in a Punter and Kicker. I feel like this kid has a top flight leg to start as a punter for anyone. Most of his games where in the rain, and Chris still punting very well, which really impressed me. As a kicker, he has a strong leg, and with the right college could start at both spots right away. 4. Seth Sebastian 6-0 175 Lafayette HS – This is a kid , that proves in my article above, that standing out in a college camp, and looking way better than everyone else will get you a scholarship, that’s the case with Sebastian, when he went to Southeaster’s camp over the summer in front of their coaches. Seth had the best camp among several kickers, and being that he can punt too did not hurt. Seth is a kid who has a strong leg, and did not play on a team that scored a lot of points to show off his skills, but again the camp showed everything they wanted to see. Seth did not kick a ton of field goals, but when he did he showed he was good from 45 yards in most of his career. 5. Steven Whisnant 6-3 195 Christian Life – There’s not a better looking kid in the state to do both positions than Steven, he has the height 6-3, the size 195 pounds, and the potential to have a nice college career. Steven will probably have to walk on to the right school if it’s DIV 1, and maybe sign with the right IAA, or D2 School in the end. I feel this kid has a DI leg, and size, just needs a chance to show it off in college. Steven will be in the 220 range in college, and if he goes to the right school might get to start right away, if it’s the smaller schools. 1. Brad Wing 6-3 185 Parkview Baptist HS – This is truly a amazing story of a kid that grew up in Melbourne, Australia, and did not enroll at Parkview Baptist till the end of the summer, get this, did not practice in spring, was in Melbourne, and did not pick up a football for the first time in his life till, the start of fall practice. Brad kicked with an Australian Rules Football, bigger more round ball, as a kid growing up in Melbourne, and had to get use to hitting the ball in the United States differently. In Australia, Brad was use to kicking the ball to players as far as 40 yards in their hands, because in Australian rules football, you can’t pass to someone, you have to kick to someone. Brad in just 4 weeks of fall practice mastered the art of Punting a football, and if you ask his teammates, he Punted the ball, at will where ever he wanted it, his hang time is incredible, and his leg strength is just flat out ball machine good. Brads dad played for the Detroit Lions as a pro Kicker, and also grew up in Melbourne. Brad had a Punt that went 73 yards his senior season, but what’s most amazing the ball traveled 64 yards in the air. Brad will be over 200 pounds easy, and I will say 220 by the time he punts in the NFL one day. Imagine how good this kid will be, when he has 2 years of experience, instead of just 4 weeks this past season, oh by the way his average was 42.7 yards a punt. I feel like even though LSU returns a senior punter, his job could be up for grabs with Brad coming in. Best punter I’ve seen coming out of Louisiana since current ST Louis Rams, and former LSU Punter Donnie Jones. 2. Jonathan Ginsburgh 6-0 190 Menard HS – This is a big time sleeper from a small Catholic school in Alexandria. This is the type of kid that will get many Walk on offers to compete for a starting job in DIV 1, but in IAA could sign a full scholarship. Jonathan has a very strong leg, and has made numerous camps in the last 4 years making his game better. I think he has DIV 1 talent, and could win a job, at a DIV 1 school, but the big schools will want him to walk on first. I like his hang time, and feel like his leg will be very good in college. 3. 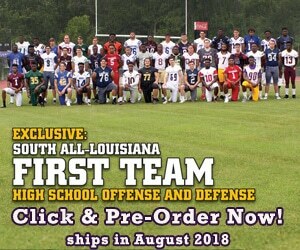 Travis Moses 6-1 194 Rosepine HS – This school right outside of Leesville, LA, has a tough kid, who has a cannon leg, built like a FS or LB for IAA football. Travis is not a household name in the recruiting world, but I’ve seen this kid Punt in two games, and was extremely impressed, impressed so much I think he can punt either DIV 1 or IAA. State schools need to give this kid a chance, because he’s got a huge upside. Played on a winning team, and did not have to punt a lot, but when he did WOW what a leg this kid has. 4. Kurt McCune 6-1 175 Destrehan HS – In 2009 Destrehan had a dual Punter and Kicker named Ryan Rome, who made a ton of pressure kicks and helped win a State title for school. Ryan signed with Tulane last year in 2008. This brings us to Kurt, who took over for Ryan, and started at Punter, and in my opinion just starting one year was really good. Loved his hang time, his size, and ability to kick for yardage. This kid is a steal for an IAA school. 5. Bryan Jackson 6-0 210 Southern Lab HS – Bryan might be the best hang time punter in the state besides Brad Wing. Don’t let his 210 build fool you, as this kid was a weapon for his team all year placing the ball, where it needed to be punted, and had great hang time. I think he could star for Southern University next year as a True Freshman. They need a punter and he goes to High School on campus, this is a no brainer. 1. Taylor Scala 6-0 180 University High – The biggest sleeper in the state as a kicker is Taylor Scala, who’s a lean 180, who will get bigger in college, I predict at least a lean 195 pounds, and might end up being as tall as 6-1 or 6-2, his brother is Morgan Scala, who’s projected to start at center for Southeastern in Hammond in 2010, Morgan is 6-2, and weighs 270 plus pounds. What impresses me about this kid is he has played WR/DB for 4 years, and was a major factor all 4 years as an Athlete on both sides of the ball. Taylor caught many passes, and had some key Touchdown catches for the team over the last 3 years. He’s not afraid to hit someone on defense, where he played CB, and excelled. Very rare to see a kid to play these positions and his Future is at the Kicker position in college. I think Taylor should be given a chance to play some WR at the right IAA school, because he has such good hands, and will be a nice size WR in college in two years. Taylor did not get to show off his leg a lot, because the school just did not kick a lot of field goals his senior season. Taylor has the leg to kick 50 yard field goals in college, and I feel with the right school giving him a chance he can do well in college. 2. Michael Conner 6-0 180 Loyola Prep HS – Conner is very similar to Scala in that he played DB/WR for his team, in Shreveport, and showed me he can hit people as a SS or FS in college. I like kickers with a FS mentality, coaches love that for college. Michael was 8/10 in field goals his senior year, and was almost perfect his junior year, what hurt Michael in not getting more attempts was the heavy rain , that he experienced as a senior in Shreveport, most of his games, the field was wet, and usually coaches choose to not kick field goals with a wet field. What’s really impressive is most of the 8 field goals made, where on a wet field, with a wet heavy ball. Michael made ALL state in 2009. 3. Hunter Stover 6-0 200 Notre Dame – How many kickers do you know that played defense and was one of the top tacklers on a State Championship team in 2009. That’s what Hunter did, kicked a bunch of extra points, and made a lot of tackles. Hunter is committed to ULL Ragin Cajuns in Lafayette, and will be given every opportunity to be the team’s starting kicker one day and a SS or LB also. Hunter made a 58 yard field goal his junior season, which is incredible, so let’s just say he has a very strong leg. 4. Jake Saltalamacchia 6-0 165 ST Paul’s -This is a kid, that can get better in college at either a DIV 1 school or IAA school, just needs to fill out and get bigger, needs about 10 pounds which will come into his frame. Jake will weigh about 190 in college, and has a very accurate leg. Might be the most accurate kicker I saw on film, made every easy short field goal, and was money for his team kicking. If needed can punt, but his future is at kicker in college. 5. James Bice 6-0 165 St Louis HS – James was mister consistent all year long for Coach Mike Johns, and made some big kicks, made one over 50 yards his senior season, and made ALL State . James just needs to improve some on his kickoffs, but as far as his leg and ability to kick field goals, he’s really good. His uncle Jamie Bice was a High School ALL American at Lagrange, back in the 1980’s, and played DB for LSU. I predict once James gets bigger, which he will, his leg will get stronger for the long kick offs in college. This kid is a no brainer as a future IAA starting Kicker, but I would not be surprised if he ends up at LSU competing as a kicker to start one day. All these kids have great futures in college, it’s just getting the chance to prove it at the right school.